Post YOUR Holiday Message for the troops! Let them know you appreciate their service and sacrifice this holiday season. Read about the Christmas Wreaths at Arlington. Welcome to www.Military-Money-Matters.com! 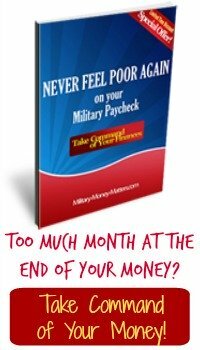 A resource created specifically to address money matters for America's Military Families. Things like . . .
How to significantly reduce your income taxes - legally! Unfortunately, our military families frequently encounter financialproblems caused by low pay, increased operational tempos (deployments), frequent family relocations, and a lack of the right kind of education or information about money management skills. We know this is the case, because we’ve been there. America's military service members are not paid nearly enough,especially in light of the sacrifices we ask them to make. Theyshouldn't have to abandon hope that their own families can live TheAmerican Dream they're helping to make possible for the rest of us. Let's Not Forget . . . Freedom is Not Free! It is only because of the sacrifices of our service members andtheir families, and all those who have gone before them, that the restof us enjoy the freedom to pursue our own American dreams. They serve courageously, with dignity, honor, and pride. Yet many ofthem must worry not only about their own physical security at the tipof the spear, but also about their families' financial security athome. We don't want a single American service member to feel he or she mustget out of the armed forces in order to provide a secure financialfuture for his or her family. The job they perform is FAR too importantto the American way of life. And frankly, we're grateful they want todo the job they do. Thus, this web site was born. It is dedicated to being aresource where our military families can find information and educationabout basic money management skills, as well as more advanced financialstrategies – secrets that have been used for generations by America’swealthiest families to protect and grow their wealth. Personally, wecan't think of a more deserving group of folks to share thisinformation with. America's finest warriors are on the front lines, protectingour freedom and giving us the peace of mind that our own families areas safe as they can be in today's troubled times. that their families are safe from financial minefields. Click on the text links below, or the navigation bars on the left, and have a look around. We think you'll find something your family can use. If you know of a resource you feel should be added here, or anadditional topic you'd like to see added, please let us know via our Contact page. to preserve your freedom. I hope you will make good use of it." Disclaimer: Information presented on this site is for educational purposes only. We make no representations or warranties of any kind with regard to the applicability of any of the topics discussed to your particular situation. Each person's financial situation is different. Before attempting to utilize any of the information found here, please seek the advice of a competent legal and/or tax professional. We accept no liability of any kind for any losses or damages caused or alleged to be caused, directly or indirectly, as a result of your use of the information contained herein.